Kids around the world love soccer. Join us to help them play it. To connect soccer-loving kids and adults here in the U.S.
to kids around the world, who lack the basic gear they need to play. The mission of FFI is the achievement of humanitarian ends through soccer. Specifically, our wish is to empower youth to support their peers from disadvantaged communities all over the world through the one language they share: soccer. Sophia Bourgeois, of Woodbury, CT, with some of the soccer gear she collected for a school in Africa. FFI connects with trusted partners to identify local needs in villages and towns around the world, and then helps kids in the U.S. raise funds for those projects. Go to Current Projects to see what we are working on, and then click on Get Involved to see how easy it is to get started, no matter how young or old you are. You'll never forget the connection you make with someone far away. And once you've reached your goal, you'll get a certificate for your service. This is a great way to stand out on college applications, and satisfy your school's requirement for community involvement. You'll also get a picture of the kids you helped, smiling with their new soccer gear! Sani Pollux coaches the Anokye Stars boys teams in Ghana. 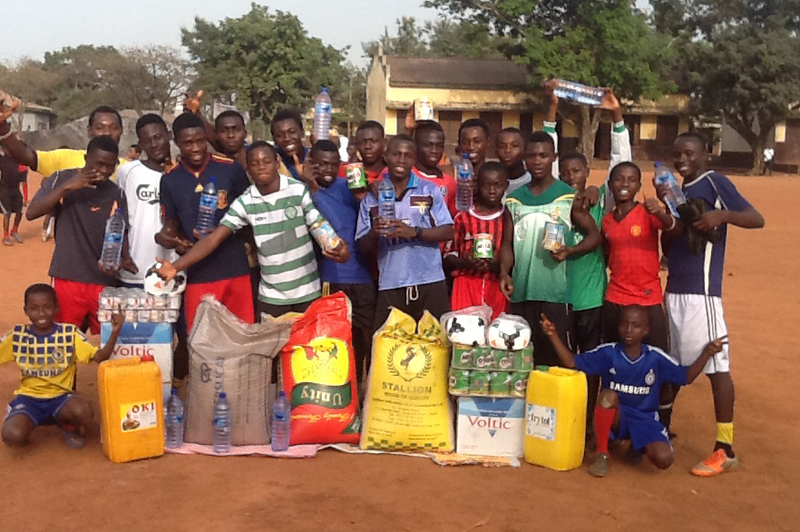 FFI recently sent the Anokye Stars $500, which immediately went to food, water, transportation, and medical attention that the boys need to stay healthy and play. Don't have a PayPal account? Click here for other options.